Posters! Sessions! Meetings! The upcoming AAS meeting in Kissimmee, Florida is shaping up to be the busiest ever! Here are the formal meeting activities the ASCL is participating in. Research in astronomy is increasingly dependent on software methods and astronomers are increasingly called upon to write, collaborate on, release, and archive research quality software, but how can these be more easily accomplished? Building on comments and questions from previous AAS special sessions, this session, organized by the Astrophysics Source Code Library (ASCL) and the Moore-Sloan Data Science Environment at NYU, explores methods for improving software by using available tools and best practices to ease the burden and increase the reward of doing so. With version control software such as git and svn and companion online sites such as GitHub and Bitbucket, documentation generators such as Doxygen and Sphinx, and Travis CI, Intern, and Jenkins available to aid in testing software, it is now far easier to write, document and test code. Presentations cover best practices, tools, and tips for managing the life cycle of software, testing software and creating documentation, managing releases, and easing software production and sharing. After the presentations, the floor will be open for discussion and questions. 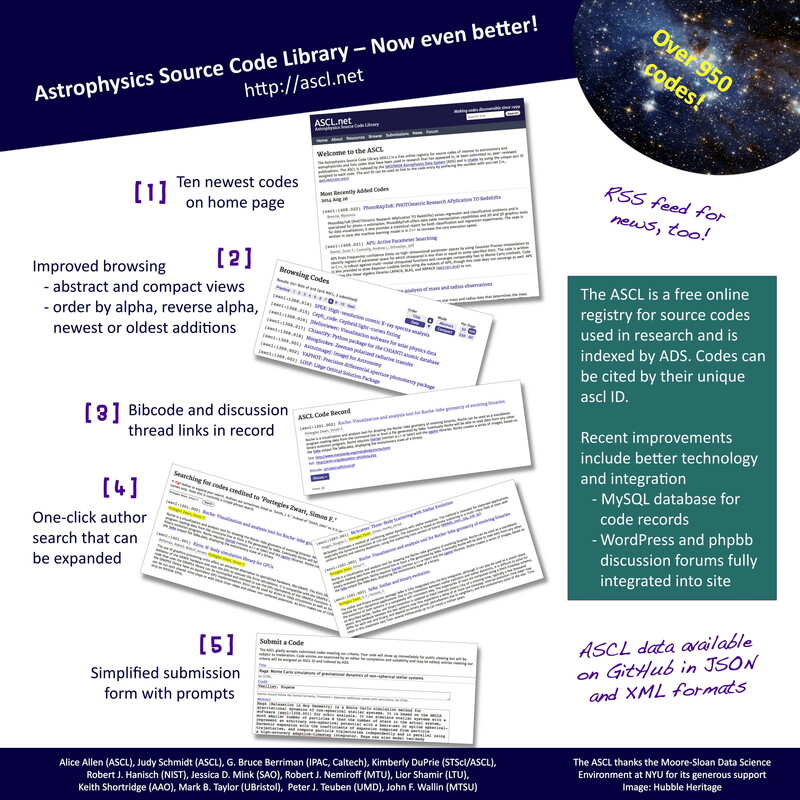 The Astrophysics Source Code Library (ASCL) is an online registry of source codes used in refereed astrophysics research. It currently lists nearly 1,200 codes and covers all aspects of computational astrophysics. How can this resource be of use to educators and to the graduate students they mentor? The ASCL serves as a discovery tool for codes that can be used for one’s own research. Graduate students can also investigate existing codes to see how common astronomical problems are approached numerically in practice, and use these codes as benchmarks for their own solutions to these problems. Further, they can deepen their knowledge of software practices and techniques through examination of others’ codes. The Astrophysics Source Code Library (ASCL, ascl.net) is a free online registry of codes used in astronomy research. With nearly 1,200 codes, it is the largest indexed resource for astronomy codes in existence. Established in 1999, it offers software authors a path to citation of their research codes even without publication of a paper describing the software, and offers scientists a way to find codes used in refereed publications, thus improving the transparency of the research. Citations using ASCL IDs are accepted by major astronomy journals and if formatted properly are tracked by ADS and other indexing services. The number of citations to ASCL entries increased sharply from 110 citations in January 2014 to 456 citations in September 2015. The percentage of code entries in ASCL that were cited at least once rose from 7.5% in January 2014 to 17.4% in September 2015. The ASCL’s mid-2014 infrastructure upgrade added an easy entry submission form, more flexible browsing, search capabilities, and an RSS feeder for updates. A Changes/Additions form added this past fall lets authors submit links for papers that use their codes for addition to the ASCL entry even if those papers don’t formally cite the codes, thus increasing the transparency of that research and capturing the value of their software to the community. This entry was posted in AAS, best practices, conferences, news, poster, presentations on December 28, 2015 by Alice Allen. As promised in a previous post, here is the list of software activities at the upcoming January AAS meeting in Kissimmee; I hope to add a Software Publishing Special Interest Group meeting to the list, but other than that, the list should be complete. If I missed anything that should be here, please (please!) let me know. Thank you, and see you there! To participate in Hack Day, please register at http://www.astrobetter.com/wiki/AASHackDay. This entry was posted in AAS, codes, conferences, poster, presentations on November 30, 2015 by Alice Allen. Months away, but AAS 227 Kissimmee meeting is already software rich! Already it’s shaping up to be a software maven’s dream AAS meeting, with workshops and Special Sessions focused on expanding your software skills and a Hack Day to put them to use! We’ll have a comprehensive listing closer to the meeting date, but here are the activities already on the schedule, with more to come! This entry was posted in AAS, best practices, conferences, presentations on September 27, 2015 by Alice Allen. On Tuesday, January 6, the ASCL, AAS Working Group on Astronomical Software (WGAS), and the Moore-Sloan Data Science Environment at NYU sponsored a special session on software licenses, with support from the AAS. This subject was suggested as a topic of interest in the Astrophysics Code Sharing II: The Sequel session at AAS 223. Frossie Economou from the LSST and chair of the WGAS opened the session with a few words of welcome and stressed the importance of licensing. I gave a 90-second overview of the ASCL before turning the podium over to Alberto Accomazzi from NASA/Astronomy Data System (ADS), who introduced the panel of speakers and later moderated the open discussion (opening slides), after which Frossie again took the podium for some closing remarks. The panel of six speakers discussed different licenses and shared considerations that arise when choosing a license; they also covered institutional concerns about intellectual property, governmental restrictions on exporting codes, concerns about software beyond licensing, and information on how much software is licensed and characteristics of that software. The floor was then opened for discussion and questions. Some of the main points from each presentation are summarized below, with links to the slides used by the presenters. Jake extolled everyone to always license codes, as in the US, copyright law defaults to “all privileges retained” unless otherwise specified. He pointed out that “free software” can refer to the freedoms that are available to users of the software. He covered the major differences between BSD/MIT-style “permissive” licensing and GPL “sticky” licensing while acknowledging that the difference between them can be a contentious issue. Universities care about software licenses for a variety of reasons, Laura stated, which can include limiting the university’s risk, respecting IP rights, complying with funding obligations, and retaining academic and research use rights. She also covered factors software authors may care about, among them receiving attribution, controlling the software, and making money. 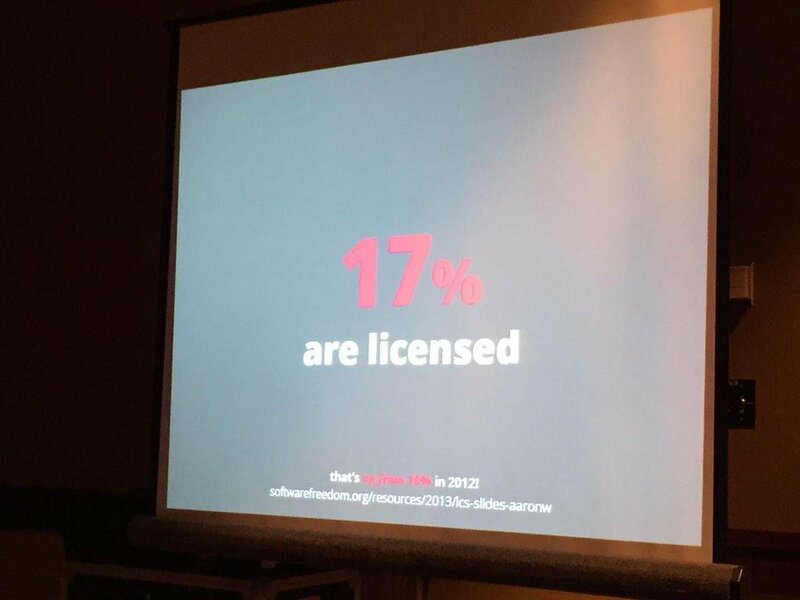 She reinforced the importance of licensing code and discussed the common components of a software license. In last year’s Astrophysics Code Sharing session, Bruce had discussed the limitations of the Caltech license under which the code Montage was licensed; since then, Montage has been relicensed to a BSD 3-Clause License. Following on the heels of Laura’s discussion and serving as a case study for institutional concerns regarding software, Bruce related the reasons for and concerns about the relicensing, and discussed working with the appropriate office at Caltech to bring about this change. 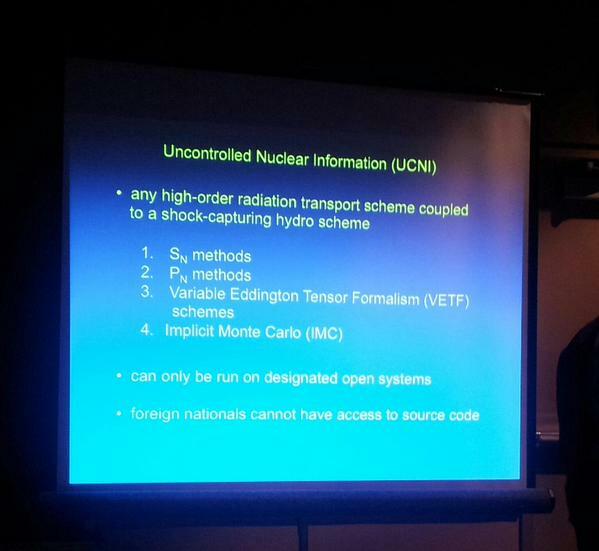 Dan’s presentation covered some of the government issues that arise from research codes, including why certain codes fall under export controls; a primary reason is to prevent the development of nuclear weapons.Dan also brought up how foreign intelligence agencies collect information and what specific simulations are restricted, and stated that Federal rules are changing, but slowly. Arfon went beyond licensing in his presentation to discuss open source and open collaborations, and how GitHub delivers on a “theoretical promise of open source.” He shared statistics on the growth of collaborative coding using GitHub, and demonstrated how a collaborative coding process can work and pointed out that through this exposed process, community knowledge is increased and shared. He challenged the audience to contemplate the many reasons for releasing a project and to ask themselves what kind of project they want to create. First, I have to note that Dan made it through 41 slides in just over the six minutes allotted for his talk, covering about seven slides/minute; I don’t know whether to be more impressed with his presentation skills or the audience’s information-intake abilities! After declaring that he knows nothing about licensing, Dan showed us, and how, that he knows plenty about mining data and extracting information from it. From his “random” selection of 1.6 million GitHub repositories, he noted with some glee that 63 languages are more popular on GitHub than IDL is, the number of repositories with licenses have increased since 2012 to 17%, and that only 28,972 of the 1.6 million mentioned the license in the README file. Dan also determined the popularity of various licenses overall and by language and shared that information as well. My thanks to David W. Hogg, Kelle Cruz, Matt Turk, and Peter Teuben for work — which started last March! — on developing the session, to Alberto for his excellent moderating and to Frossie for opening and closing it. My thanks also to the wonderful Jake, Laura, Bruce, Dan W, Arfon, and Dan F-M for presenting at this session, and to the Moore-Sloan Data Science Environment at NYU and AAS for their sponsorship. Many resources on licensing, including excellent posts by Jake and Bruce, can be found here. This entry was posted in AAS, best practices, conferences, discussion, software licensing, special sessions on January 19, 2015 by Alice Allen. Abstract: The Astrophysics Source Code Library (ASCL, ascl.net) is a free online registry of codes used in astornomy research. Indexed by ADS, it now contains nearly 1,000 codes and with recent major changes, is better than ever! The resource has a new infrastructure that offers greater flexibility and functionality for users, including an easier submission process, better browsing, one-click author search, and an RSS feeder for news. The new database structure is easier to maintain and offers new possibilities for collaboration. Come see what we’ve done! This entry was posted in AAS, conferences, news, poster on January 6, 2015 by Alice Allen. Below, a list of informative, interesting (or both!) 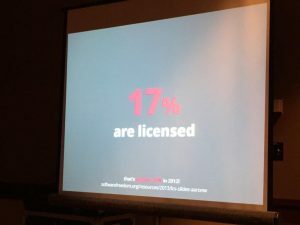 writings about software licensing; the ASCL doesn’t necessarily agree with all positions in these articles, but we want to know what people are thinking even when we don’t agree with them. Discusses dual-use technologies, which is what codes are under ITAR. These are governed by the Wassenaar Arrangement. The countries that participate meet 3x/year to decide what restrictions to put on dual-use technologies. Dr. James Harrington was the speaker. Slides available on that page. This entry was posted in AAS, best practices, discussion, software licensing on January 5, 2015 by Alice Allen. A short list without the descriptions, other information, and Saturday-start bootcamp the longer list has, because short is beautiful, too! Some may require registration/charge a fee. This entry was posted in AAS, conferences on January 4, 2015 by Alice Allen. One of the unconference sessions (proposed during the event) held at December’s .Astronomy was on software citation, this subject having come up in an earlier session on improving credit for software. Discussion and comments in the session inspired me to look at astronomy’s current practices for citing software. Though not an exhaustive list, I looked in more than a dozen journals for citations for codes used in research, and below are some of the examples I gathered. Someone — I don’t remember who — reported that Google Scholar does not index mentions of codes, GitHub repos, etc. as citations, because they are not papers. An opinion tweeted out about this summed up the sentiment in the room pretty well! I plan to take this up with Google after the AAS meeting. Fortunately, ADS does index properly formatted software references; the only reference listed in this post that I didn’t see captured by ADS was the URL for CAMB, which is not surprising (nor expected). A subsequent post will include additional information and a list of resources about software citation, to be posted before the first Special Interest Group on software publishing meeting scheduled at AAS225 that will be held on Tuesday, January 6, from 3:45 PM – 4:45 PM in 615 in the Convention Center. The main topic of this meeting will be software citation, and all interested parties are welcome to attend. The journals below were part of my hunting grounds for software citations. Ever had a citation to software you used in research refused by a publication? If so, I’m interested in knowing the details; please share here or send them to editor@ascl.net. Thanks! Formatting counts! Below, two citations for Turbospectrum, the first formatted in a way ADS can pick up and count the citation, the second one not. This entry was posted in AAS, best practices, codes, conferences, discussion on January 2, 2015 by Alice Allen. The AAS’s Working Group on Astronomical Software (WGAS) has invited the ASCL to form a Special Interest Group (SIG) on software publication. We think this is a dandy idea and have accepted the invitation. The inaugural meeting will be held on Tuesday, January 6, from 3:45 PM – 4:45 PM in 615 in the Convention Center. This is immediately after the Licensing Astrophysics Codes: What You Need to Know special session that is from 2:00-3:30 in that same room. As issues around software citation came up several times at this month’s .Astronomy meeting and has received subsequent discussion online since, it seems fitting for this to be the main topic for the first meeting of the SPSIG. Please note that this SIG meeting does not appear in the AAS schedule. The meeting is open to anyone who is interested, and additional information will be posted here as it becomes available. This entry was posted in AAS, best practices, conferences, news on December 23, 2014 by Alice Allen. Software is an integral part of astronomy research and the American Astronomical Society meetings reflect this. The upcoming AAS meeting in Seattle (January 4-8) offers workshops, sessions, posters, tutorials, and discussions that focus on many aspects of astronomical software. On Tuesday, join us for a special session on code licensing; immediately after, the inaugural meeting of the Software Publishing Special Interest Group will be held. On Thursday, the wildly successful and fun Hack Day returns. Hack Day includes but is not limited to hacking software; whatever skills you have or project you want to take on, there’s a place for you at Hack Day! Organized by day, below is a list of software-related offerings at the AAS meeting. See you there! Computing is now an integral part of every aspect of science, but most scientists are never taught how to build, use, validate, and share software well. As a result, many spend hours or days doing things badly that could be done well in just a few minutes. The goal of AAS 225 Software Carpentry 2 day “bootcamp” is to change that so that astronomers can spend less time wrestling with software and more time doing useful research. Further, good quality, well tested code means science results are easier to verify, share, and update. More information on the Software Carpentry project can be found <http://software-carpentry.org>. The AAS 225 Software Carpentry bootcamp consists of short tutorials alternating with hands-on practical exercises and will cover the core software skills needed build, use, validate, and share software in astronomy: Saturday’s tutorials will comprise shell automation, basic python programming, and unit testing; Sunday’s sessions will shift to focus on advanced python, including numerical and astronomy oriented computing, and version control. Registration is for both days. The target audience for the bootcamp consists of graduate students and early career scientists. The Software Carpentry @ AAS 225 Bootcamp will be run by a set of three certified instructors and a team of helpers. Participants will be required to bring laptops and to install software in advance of the workshop. Some basic familiarity with shell based computing was assumed in setting the bootcamp schedule. See also a FAQ at http://software-carpentry.org/faq.html for more information. This tutorial will cover the features and capabilities of Astropy and affiliated packages. The volume of data available to astronomers today is enormous. The standard pattern of working with flat files doesn’t scale to what’s available now, let alone with the increasing amount of data that is coming. Every astronomer should have the skills to work with databases both for their own data sets and what is publicly available. This workshop will teach how a database is designed, how to create your own, how to populate it with data, how to query that data, how to work with other databases, and how to write scripts against a database. Exercises and examples will be geared to astronomical data but will be applicable to nearly any data. Participants should have a basic comfort level with Python and will be required to install some software on their laptops before the workshop. The workshop will be presented by Demitri Muna (Ohio State University), creator of the SciCoder workshop, and Alex Hagen (Pennsylvania State University). Distributed collaboration is a hallmark of modern international astronomical research. We collaborate on everything from software development to paper and grant writing to sharing new results, plots, and data files. The goal of this workshop to provide new tools and techniques for productive efficient collaboration online. This workshop will begin with a hands on tutorial of GitHub. This will include reviewing distributed version control systems and learning collaboration workflows using the GitHub system. During the second part of the workshop we will explore an array of other online tools, ranging from cloud storage (DropBox, Google Drive) to collaborative document creation (Google Documents, online LaTeX editors) to feature tracking platforms (Trello, Jira) and much more. We intend to provide concrete workflows and to imbue you with tips and tricks for using these online tools in your research groups. The target audience for the workshop consists of astronomers at all points in their careers. Presenters will include Arfon Smith <https://github.com/arfon>, PhD Astronomer turned Zooniverse developer turned Github Science head, Brent Beer, a GitHub Trainer, and August Muench (Smithsonian). Participants will be required to bring laptops and to install software in advance of the workshop. Familiarity with git or other version control systems is not a prerequisite. Research in astronomy is increasingly dependent on software methods and astronomers are increasingly required to share their codes; those who write software need to choose a license that delineates whether, when and how others may use and extend this software. Building on comments and questions about licensing in the January 2014 AAS special session “Astrophysics Code Sharing II: The Sequel”, this session, organized by the Astrophysics Source Code Library (ASCL) and AAS’s Working Group on Astronomical Software (WGAS), and the Moore-Sloan Data Science Environment, explores why providing an explicit license for software is important, explains different common licenses, examines intellectual property concerns common to universities, and provides information on restrictions that arise from ITAR. A panel of speakers will discuss code licensing, share considerations that arise when choosing a license, and benefits of the licenses they chose. Institutional and governmental concerns about intellectual property, its licensing, use, and release, will also be covered. The floor will then be open for discussion and questions. This first meeting of the to-be-formed-at-AAS225 Software Publication Special Interest Group (SPSIG) is open to all interested parties. The main topic of discussion at this meeting will be software citation. 336.57. Astrophysics Source Code Library — Now even better! The AAS Working Group on Astroinformatics and Astrostatistics hereby proposes a Special Session for the 225th AAS meeting in Seattle which will highlight the importance of data analytics training in astronomy, both for the sake of astronomical research and in order to make astronomy graduates more employable. Although astronomy and astrophysics are witnessing dramatic increases in data volume as detectors, telescopes, and computers become ever more powerful, the traditional training of astronomy and physics students is not providing skills to handle such voluminous and complex data sets. Equally worrisome, research funds and hiring options in astronomy are diminishing; in particular, a number of candidates for permanent (or steady) jobs significantly exceeds the job availability. As a result many of astronomy graduates have transitioned out of astronomy to work in areas where their analytic skills become highly valuable. Invited talks by a recent astronomy Ph.D. graduate who transitioned to industry, and an industry representative, will critically compare academic and industrial environments.The main goals of the proposed session are to discuss ways to improve Big Data training and research in astronomy, as well as to explore the connections between data science in astronomy and in the other research or technology areas where astronomy postdocs or recent graduates could excel and compete. We will use moderated panel method to facilitate discussion of graduate curriculum at Astronomy Departments, and invited talks to highlight connections to industry. The Square Kilometre Array (SKA) is one of the most awe-inspiring and audacious science and engineering projects of the 21st Century. With its hundreds of thousands of antennas spread across Africa and Australia, the SKA will have unrivalled scope in observations and is designed to address fundamental questions about the earliest stages of the Universe, such as star formation, dark energy, gravity and life itself. When fully operational in the early 2020s, the SKA will produce 10 times the data of the current global internet. Processing this vast quantity of data will require very high performance central supercomputers capable of in excess of 100 petaflops of raw processing power: about three times more powerful than the most powerful supercomputer in 2013. In addition to developing this high performance computing hardware and software capability, the project must also address the incredibly complex tasks of signal processing, data transfer, storage and curation, and data manipulation. To develop these revolutionary technologies and drive tomorrow’s groundbreaking science, effective global partnerships between governments, academia, and industry are becoming essential. With their long-standing tradition of radio astronomy, the US can bring much expertise to such global partnerships, while at the same time gaining strategic access to world-class instruments. This session will be divided in 2 parts: – Science: Through the case study of the SKA precursor telescopes MWA, ASKAP and MeerKAT, and of the first-class observatories LOFAR and JVLA, we will see how major science questions are already being touched upon, paving the way for the revolutionary capabilities of the SKA. We will finally examine how a project the scale of the SKA will push the frontiers of scientific knowledge.- Computing: The sheer amount of data collected by the SKA will drive fundamental shifts in science-driven technology with daily-life applications in the areas of data transport, data storage, high-performance computing, and algorithm design. We will first present the SKA global computing and technological challenges, and then give the floor to experts from High Performance Computing industry who will provide their views on how they aim to tackle these challenges and how the SKA is driving technology development in a number of domains. A day to work intensively on collaborative projects. A wide variety of projects will be undertaken and will be everything from software development and coding to creative outreach projects. Projects that take advantage of the unique gathering of enthusiasm and expertise at the Winter AAS Meeting are particularly encouraged. Hack ideas and participants will be solicited before and during the meeting. Participants can either lead a project or join a project and should plan on focusing primarily on only one hack. In addition, we ask participants to commit to hacking for the majority of the day. Registration is encouraged to facilitate pre-meeting coordination, but not required. This entry was posted in AAS, conferences, news, poster, software licensing on December 18, 2014 by Alice Allen. Page rendered in 0.484 seconds. Blog powered by WordPress.